Sampling is available in data binding scenarios only. Sampling is also not applicable when plotting data for properties of non-CLS compliant types, like uint. When the chart is populated by thousands of items, the visual representation might not be that clear. It is possible that there are two or more DataPoints shown with a very close Y and X values. This is when sampling comes in handy. The chart combines the items, so that the DataPoints are limited to a certain number (200 by default). The sampling engine does not detect/determine whether the datapoints will be on similar pixel coordinates. Instead, it visualizes a subset of the original data. For example, if you have 1000 points, 95% of which are clustered together, and you choose a sampling threshold of 300 points, 95% of these 300 points will be clustered as well. In such a scenario, one possible option is to use Zooming and Scrolling. Set the SamplingThreshold to 0 to disable the feature. The way in which RadChart combines the DataPoints depends on the value of the SamplingFunction property of the SamplingSettings. When binding without series mappings, the value of the RadChart.SamplingSettings.SamplingFunction determines the pattern. When binding with series mappings, the value of the pattern is determined by the value of the ItemMapping.SamplingFunction. The SamplingFunction property has the following values. Average - takes the average value of the sampled points. KeepExtremes - shows the minimum or the maximum point. The one that is farthest from the sample average is shown. Min - shows the minimum point. Max - shows the maximum point. Sum - shows the sum point of the points. 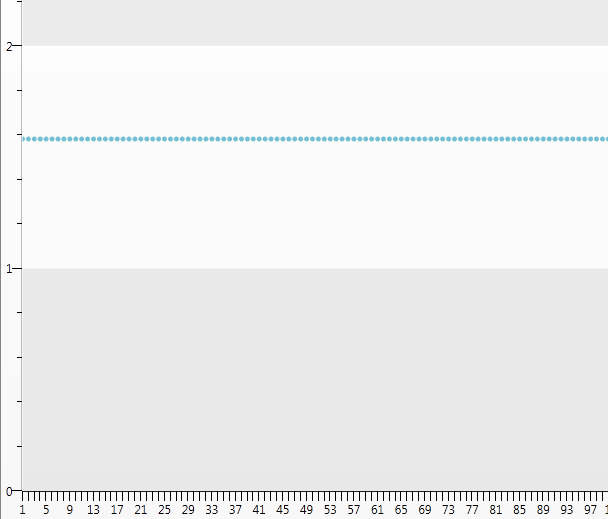 First - shows the point with the smallest index in the series area that is to be sampled. Last - shows the point with the highest index in the series area that is to be sampled. Custom sampling functions are implemented in the same manner as GridView's custom aggregating functions. The following sample code will demonstrate how to create a standard deviation function for the Range of numbers 0 - 1000 and creates ScatterSeriesDefinition with the result from this function. Sum-up the result of steps 1-3 over all of the values. Takes the square root of the result. The LabelStep of the AxisX is set to 4 for better readability.